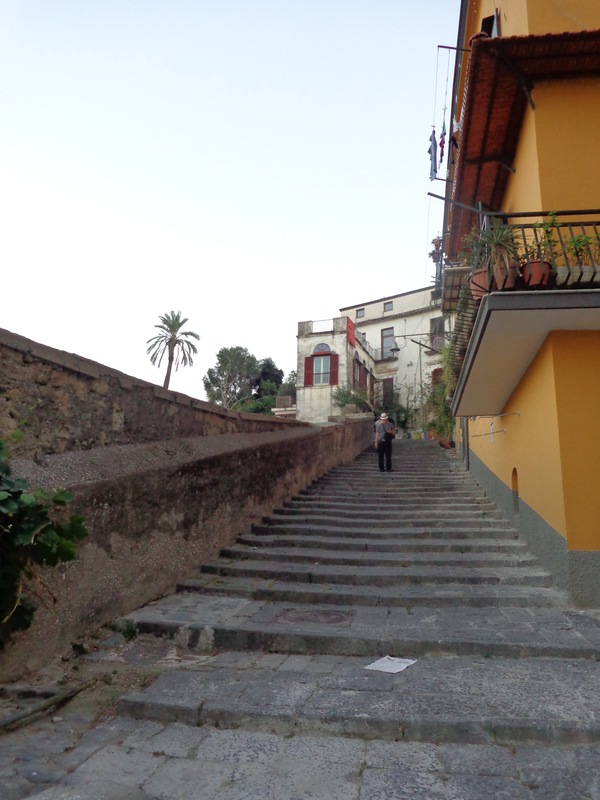 San Martino, a small community high above the sprawling city of Naples, is a refuge from the chaos and confusion of overcrowded metropolitan life. 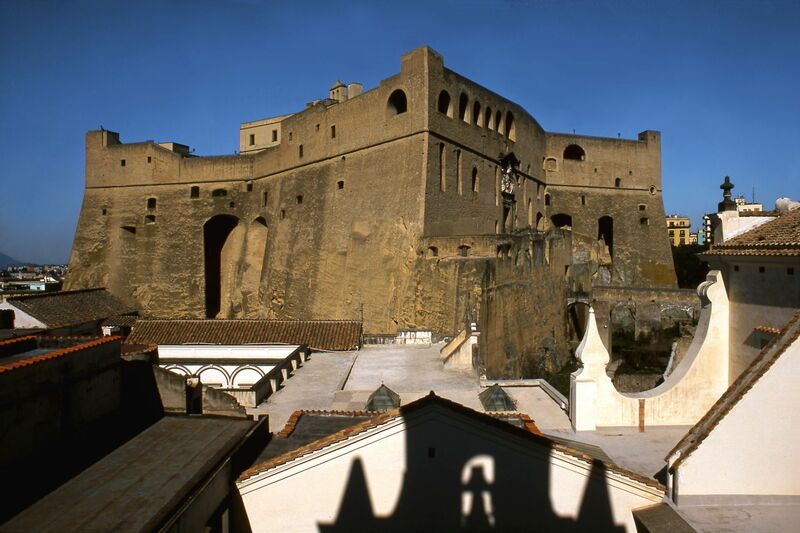 With a reputation of being one of the best neighborhoods in the city, it is also the home of two outstanding historical buildings; Castel Sant’Elmo and the former Carthusian monastery of San Martino which is now a museum. 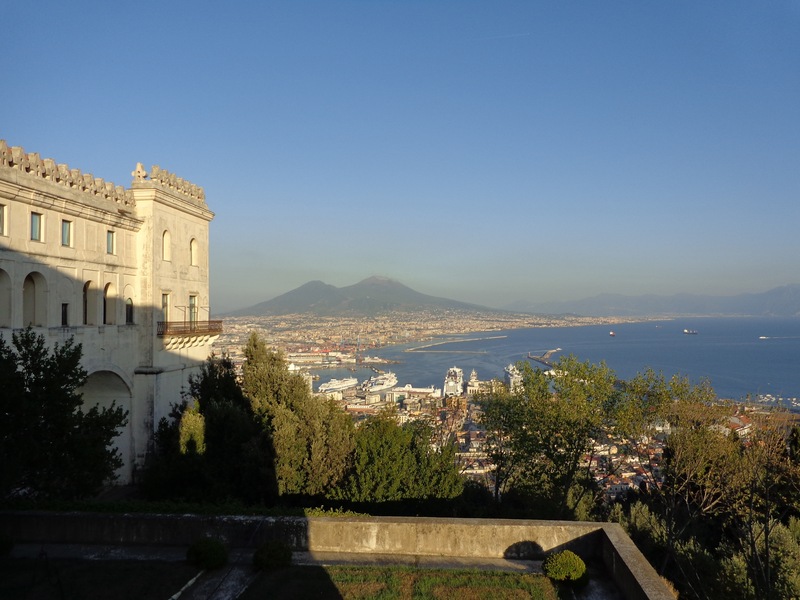 As impressive as these two landmarks are, it is the sweeping view of Naples and the surrounding bay that take my breath away. 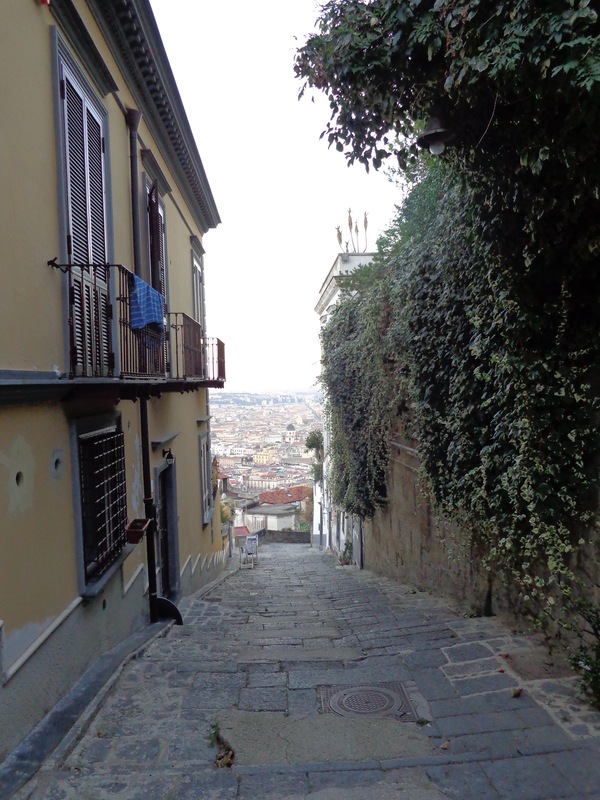 To reach San Martino at the top of the hill, I took a funicular from the crowded shop-strewn area of Montesanto. A funicular is a cable car that is pulleyed up the hillside. The neighborhood was clean and calm by comparison to the bustle below. I found it a refreshing escape. People drove normally and the streets were clear of bumper to bumper cars parked along the curb. 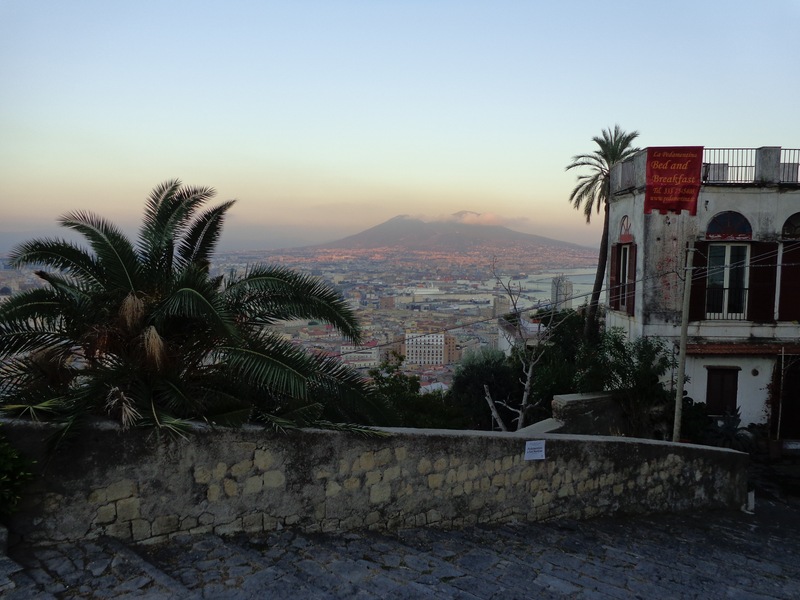 Once I reached the museum of San Martino on foot, which was a short uphill climb from the funicular, I was greeted by stunning views of the city of Naples below. Land and sea spanned out in every direction with a vast multitude of buildings that housed the crowded metropolis. 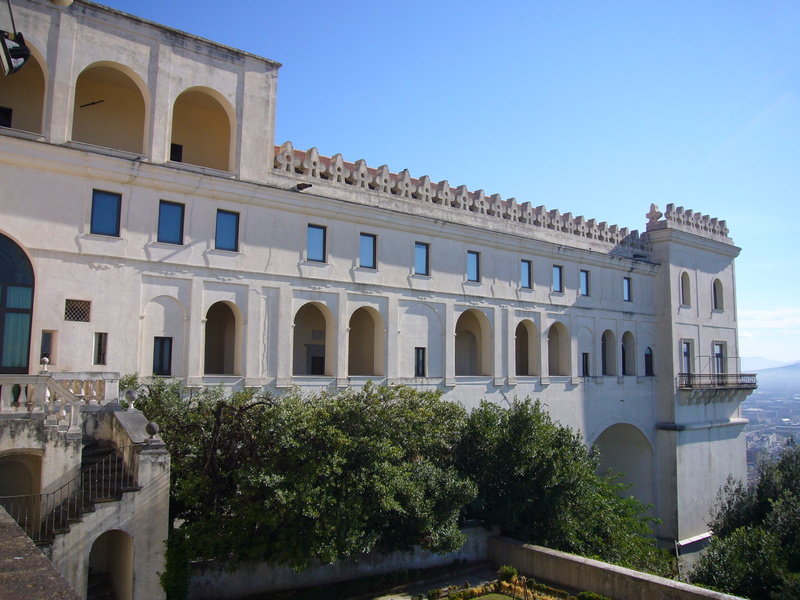 The former monastery, finished and consecrated in 1368, is now a museum with outstanding Bourbon and Spanish era artifacts. World-renown nativity scenes, old wooden ships, horse-drawn Cinderella carriages and several rooms of beautiful paintings brought the museum to life. In the center is a courtyard with gardens and an old monks graveyard. This huge covered porch is part of the old monastery museum. As I walked around the entire perimeter, views of Naples, the water and surrounding districts sprawled out before me in one vast sweep. Sparkling and beautiful, my camera was fast at work in a futile attempt to capture it all. But still the photos give a glimpse of its boundless splendor. The inner courtyard within the museum was very old but beautifully arched. 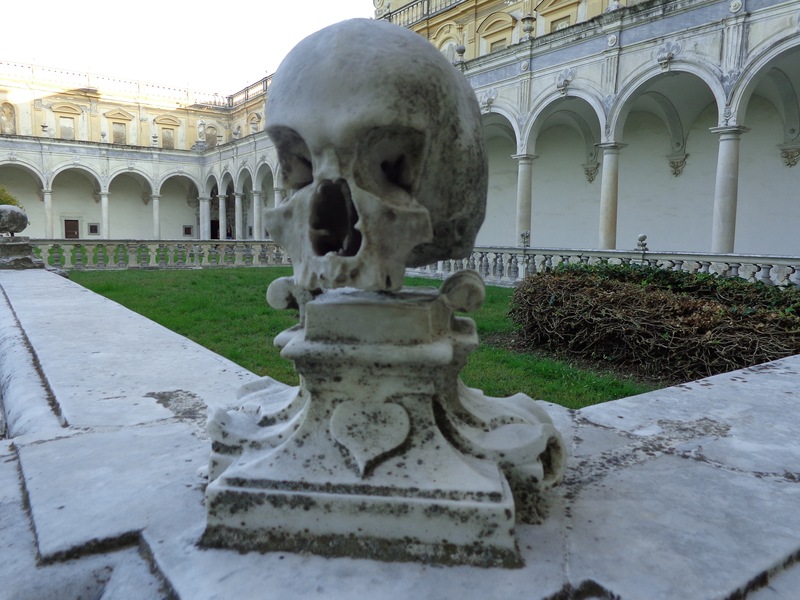 This large marble square was marked with skulls all the way around. The Castle stands tall and mountainous next to the museum. On the way back down I took the stairs instead of the funicular. 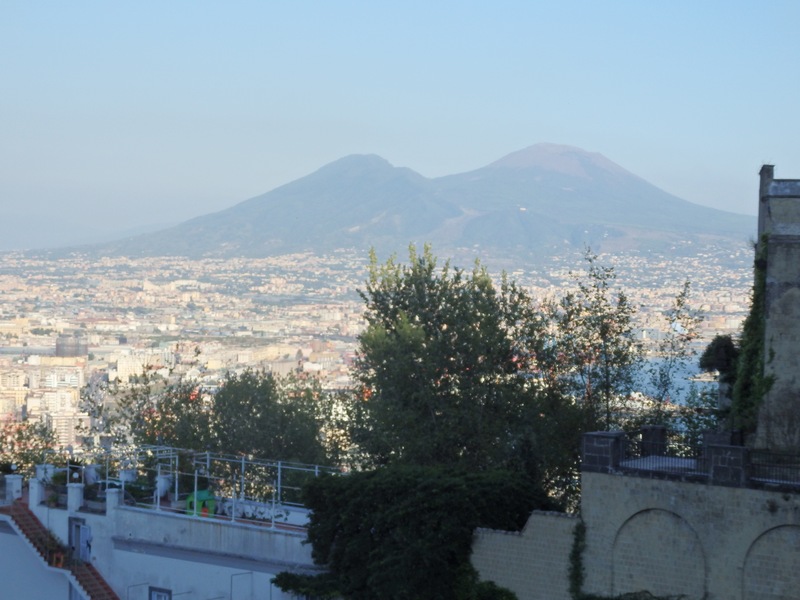 It zig-zagged back and forth, providing many wonderful views of Naples as I descended. Old homes and garden walls framed the stairs tightly. Strolling through a neighborhood street while descending, with Naples ahead. These houses were so close to the pathway that I could clearly hear conversations coming from them through the open windows. Older women were hanging their wash out to dry, and smells of cooking drifted through the air, making me hungry! I had worked up an appetite! This sign looked good so I stopped on by. I think this will do nicely! 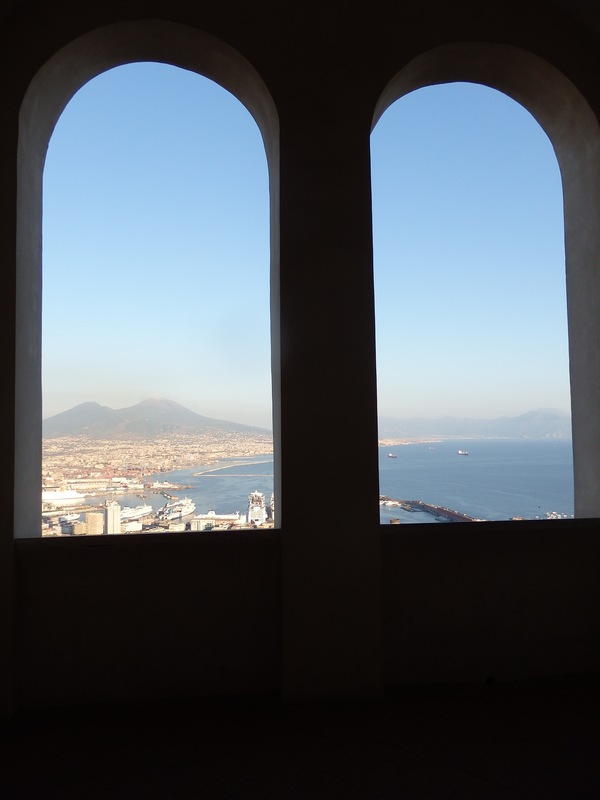 I hope to return to San Martino and stand once more at the old fortress walls to gaze out at the vast beauty of Naples with all its charms. Mt. 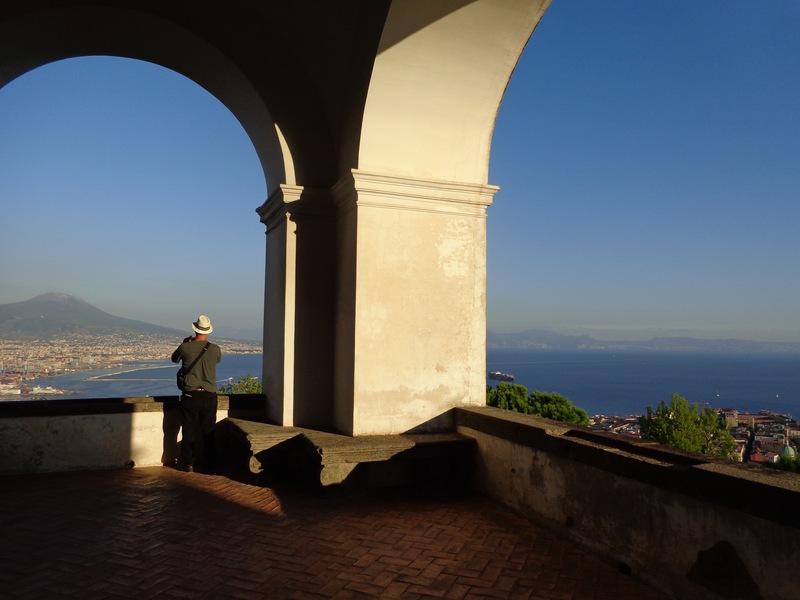 Vesuvius, the sparkling bay, reddish-pink sunsets that streak across the sky….all that encompass the ancient symmetry of an aging land . 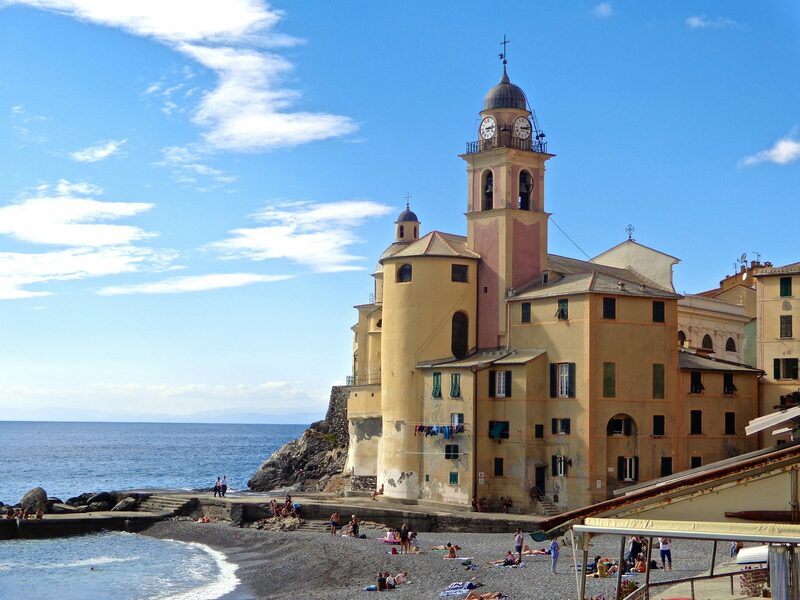 I am so glad to see this post, Susan – I have avoided Naples for many years because people have told me it isn’t that beautiful. You have proven them wrong – and I very much look forward to being there during my next trip to Italy. Thanks for the tour! David, I am so glad you enjoyed the post, and that you are going. 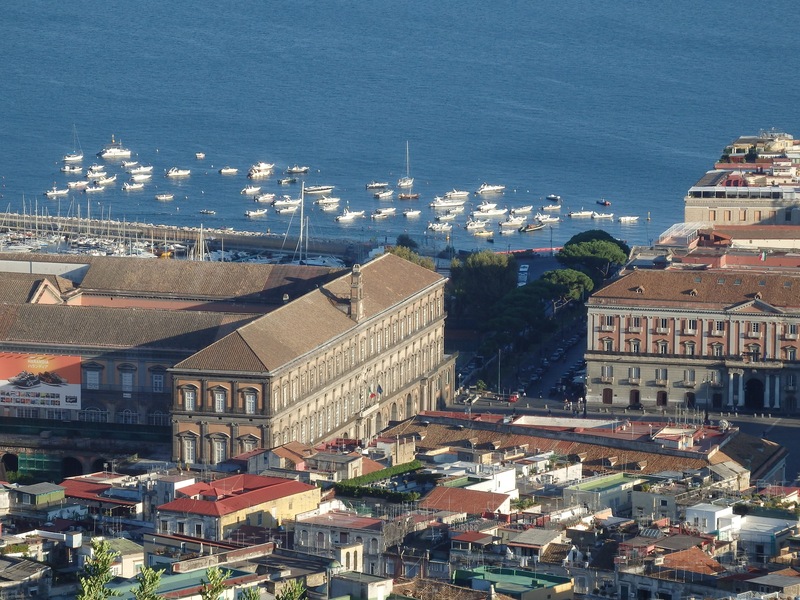 The beauty of Naples is mainly from above from San Martino as you can see. The waterfront has a wide and long walkway that is very nice as well. Inland is a maze of streets that you can easily get lost in. Have a good map with you. There are some hidden gems among the clutter and chaos! I have always felt safe while visiting although others have warned me to be careful. Driving is very nerve wracking, and I don’t recommend it. Beautiful photos, Susan. 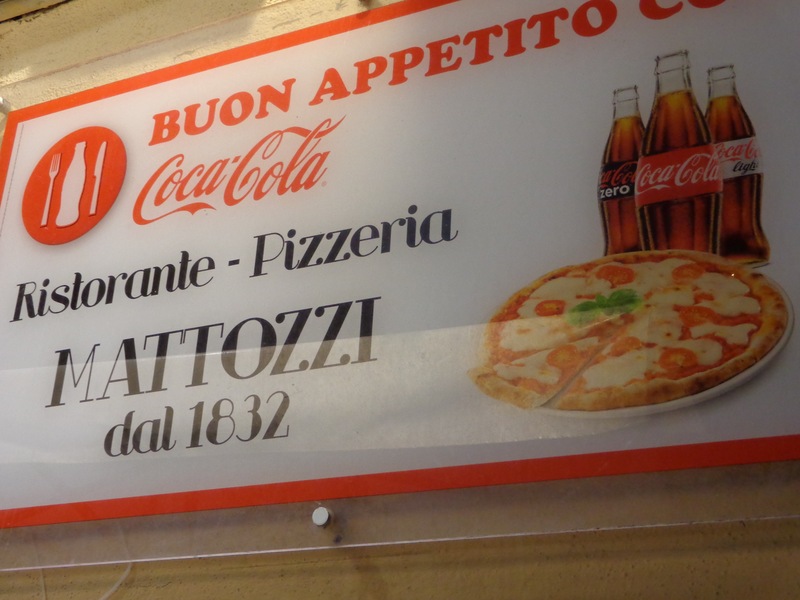 I haven’t been to Naples in years, but these make me want to return. San Martino up above is where you will find those stunning views. I also loved the waterfront in Naples, especially during early evening. The rest is quite a maze of old medieval ‘confusion’ but still vibrant and full of life. It is a rare experience for sure! Photos are breathtaking, Susan. It’s beautiful and you can look out and see the sea and coastline and the houses. I love the architecture and felt like I was walking down the cobbled street with you. It’s amazing how you can look out over a wide, expansive area. It’s like that where I live in Colorado. If you get up high, you can see for miles. You’re truly welcome, Susan. I’m glad I found you and connect in this way in our stories and photos. I’m happy to spread the love and share you with my readers. I feel the same about you as well…you do so much good for others…keep it up, Pat!! As a first-generation Neapolitan-American, this latest chronicle really stirred the ancestral embers! What wonderful places so beautifully described! 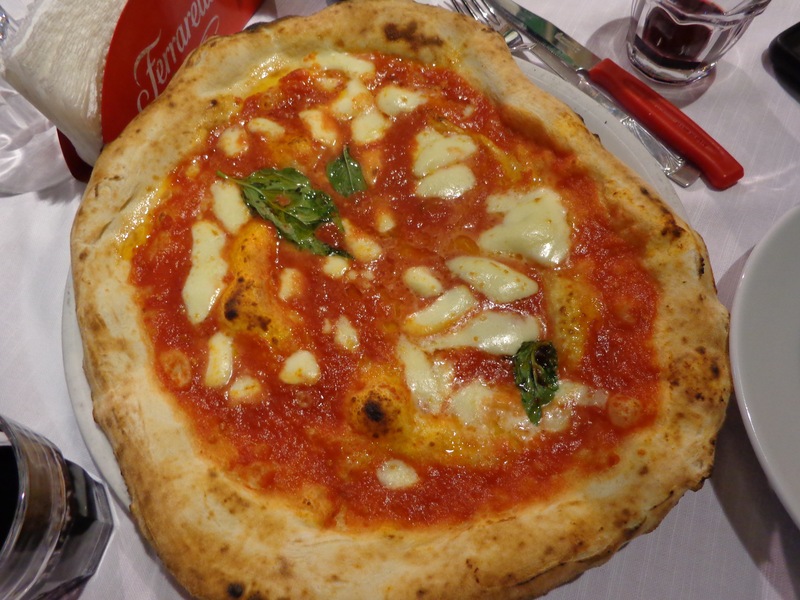 My wife and I have been to Naples a few times but you have been to some places we have not yet had the pleasure of seeing! Your dramatic photos called to mind an “aural depiction” of Naples, captured by an old Columbia Masterwork LP (a truly wonderful 33 1/3 record) called “NEAPOLITAN GOLD”. It’s hard to describe the musical experience, but many of the photos you took reminded me of the Neapolitan music on this LP. The orchestrations of classic Neapolitan songs are by one Gianni Monese and are incomparable…I don’t think I have EVER heard their equal over all these years. I recommend trying to get a copy of it on Ebay or other sites. 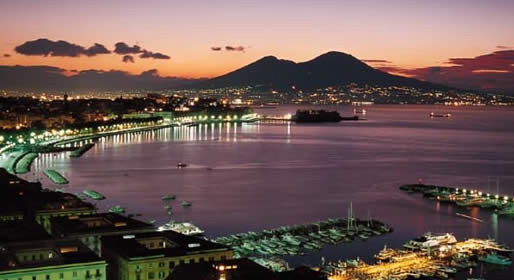 The musical experience is nothing short of magical and will reach deep down into your heart as you recall the mental images of these wonderful places you have visited in Naples. I leave you a link to the image on the NEAPOLITAN GOLD album cover–itself a marvel of color photography!